If you do a lot of hiking, then you know at the end of the day you end up just feeling beat – sore feet, tired legs, and you kinda just don’t want to move. While I tend to think of these feelings as a day well spent, I can’t deny the appeal of eliminating some of those feelings. 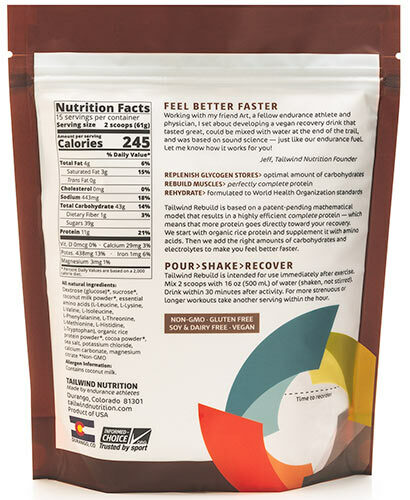 And that’s why I was excited to test out the new Rebuild Recovery drink mix from Tailwind Nutrition. And since everyone’s tastes and bodies are different, I enlisted another willing volunteer to test this out with me after some challenging hikes. Disclaimer: Tailwind Nutrition sent me free samples of this product for my evaluation. While the products were free, this review features 100% honest opinions after our real testing of this product. If you’ve never heard of this stuff before, then let me give you a quick intro to this sport recovery drink. It is a powered mix that you add to water and then drink after a lot of physical activity – things like marathons, big hikes, cycling, etc. It’s packed with protein and electrolytes, an good news vegans – you can drink it too! We start with organic rice protein, and supplement it with amino acids to make that protein complete. Then we add carbohydrates, some healthy fats from coconut milk, and just the right amount of electrolytes. Nothing repairs your muscles more efficiently, restores your energy faster, and makes you feel better sooner. And athletes love the great tasting healthy vegan ingredients. And so, we got to work testing this out to see if it really lives up to the hype or not. Since I’m not into marathons or long days of cycling, I decided that the best way for the Active Weekender team to test out Rebuild Recovery by Tailwind Nutrition was after some epic hiking. 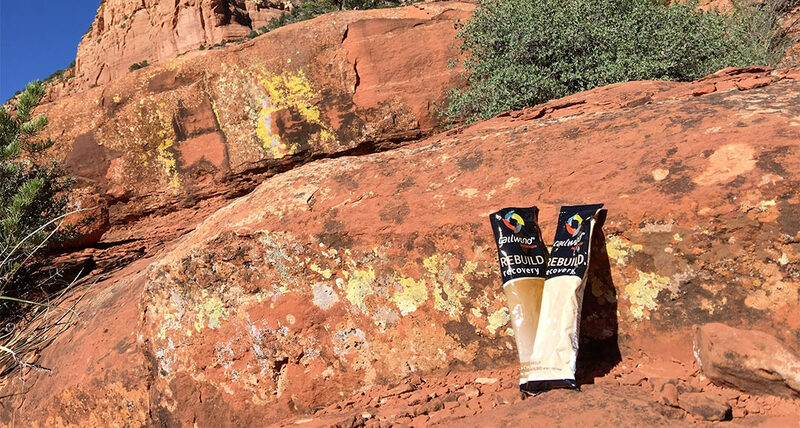 So, we packed up and headed over to Sedona for a few days to do some hiking and see how our bodies would feel post-hike after consuming some of the Rebuild Recovery drink mix from Tailwind Nutrition. The hiking was rather strenuous (due to both the trails and the elevation) and it was quite warm in Sedona, so by the time we were finished hiking we were rolling in sweat and feeling the fatigue and a bit of hunger start to set in. I should note that we had plenty of water in our hiking daypacks, as well as snacks, to keep us hydrated and fed while on the trail. Typically my go-to trail snack is some almonds, but this time we noshed on some coconut/honey/cacao nib “cookies” and organic candy corn. I know, I know, candy corn is truly a terrible trail snack and I would never advise anyone to take it as a trail snack. I honestly took it along for the energy boost since it’s basically pure sugar with all the honey in it. 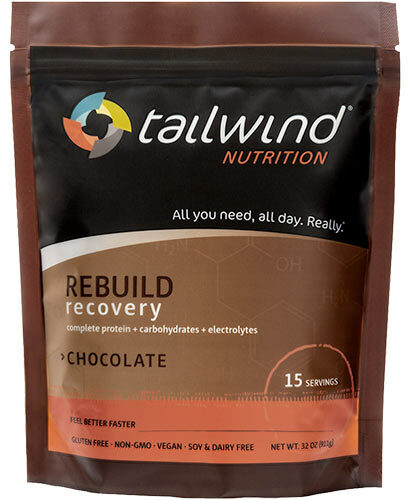 After we finished up hiking, we set to work testing out both flavors of the Rebuild Recovery drink mix from Tailwind Nutrition – vanilla and chocolate. You’re supposed to take the powdered mix and shake it up with 16 oz. of water. We used our Hydro Flask water bottles to do this part. Note: Before drinking this, I had some concerns about the sugar content of this mix. It has a whopping 39 grams per serving! In my day-to-day life, when I consume more than around 14g of added sugar in a day, then I start to notice inflammation, muscle aches and cramps. So, I was worried this might actually make me more sore at the end of the day. I’ve read other bloggers saying that this stuff is a lot like a protein shake, but I’ve never had one of those so this was a completely new experience. And truth be told, I had no idea how long I was supposed to shake up this mix with the water. I know, it sounds kinda stupid and I probably could have looked it up online, but I just shook it for what I thought was a while and then we tried it. Spoiler alert – I did not mix the vanilla one up enough before I tasted it! So, that was a bit unpleasant and I don’t recommend it. I think one of the things I was most curious about was how would this mix actually taste. If you’re wondering the same things, then here are our thoughts. As you can see, Riley is not exactly a fan of the taste, and I told her that no one would be carrying milk with them on a trail or at a marathon, so no, you can’t put it in milk. Since I didn’t need to drink two servings, I tossed the vanilla one and consumed the entire chocolate one. As I mentioned above, I was actually really worried about the sugar content of this drink mix. Since I’d eaten the candy corn on the trail, I was definitely way over my normal daily sugar consumption and I feared a night of foot cramps and aches. Before I tell you how this made me feel, let me give you a example of my normal post hike routine and how I feel. Usually when I’m hiking, I keep things like bottles of electrolyte water and PB&J sandwiches in a cooler or something like a can of tuna with whole wheat crackers. Then, after a hike I eat whatever protein I’ve brought with me, load up on the electrolyte water, and munch on almonds or mixed nuts to get some salt. And if I’m due to have a meal afterwards, then I go for something with protein like grilled chicken or a burger. So, basically, I load up on protein and try to replenish the electrolytes I’ve lost. Yes, I’m usually a bit tired and sore, and if I’ve done a lot of hiking, then it’s not unusual for me to experience foot cramps. I usually attribute the foot cramps to lost electrolytes that I couldn’t replenish. So, when I tested this drink mix, it was after a full morning of hiking. I consumed the mix at around 1:30 pm, so that means that I actually had two regular meals left to eat on that day. Maybe an hour or so after consuming the chocolate Rebuild Recovery drink mix from Tailwind Nutrition, we decided that it was time to grab some lunch. I’d expected that we’d need to drive to a restaurant, despite most of Sedona being walkable, but I thought I’d be too sore. But, we walked to it and it was actually fine. I did notice that my feet were still sore from the hike and my shins were a bit sore (though that may have been cause I didn’t do any stretches before the hike). I know, more sugar with the cookie! But hey, in for a penny, in for a pound, right? Now, normally when I do a hike like I’d done on this morning, I am still ravenous for protein by the time dinner rolls around. But, surprisingly that was not the case this time. Honestly, I think it’s clear that Tailwind Nutrition’s Rebuild Recovery (along with that burger) helped me to get all my protein in so that I was no longer craving it like I usually do. So, that’s a win! The biggest win for me though was that I didn’t experience any foot cramps later that evening. So, not only did this seem to prevent the cramps, but all that sugar didn’t cause any either! If you’ve ever experienced really painful foot cramps after lots of activity, then you know what a relief this was for me. I also noticed that I felt pretty relaxed the rest of the day instead of just feeling tired (like usual). I didn’t even experience a sugar crash, which you would have thought would happen after consuming 39 grams of sugar! I also noticed that I didn’t need to snack on salty things at all that day. Normally, I’m popping salted almonds or other nuts after a hike and I didn’t even open my bag of mixed nuts on this hiking trip. So, it truly did replenish all of my electrolytes. Though, I should add here that I was drinking electrolyte water part of the day. Sadly, though, I did wake up the next day with soreness. I’d hoped that this was a miracle drink and I’d wake up feeling like I hadn’t done all that strenuous activity the day before. Ha! I know, Tailwind Nutrition doesn’t promise that, but I’d read other reviewers saying that it did, so I was really hoping I’d experience that. However, despite still experiencing some soreness the next day, I was not tired or fatigued at all, which was nice. Would I use it again? Probably so, if nothing else than to just prevent the foot cramps after a lot of activity! Since my experience using this ended up being a much longer review than I’d expected, here’s a brief summary of the high points for you. Didn’t like the taste of the vanilla, but the chocolate was better. Gave me all the protein I needed, which I normally don’t get on my own post-hike. It really did replenish my electrolytes cause I didn’t need to snack on salty stuff after the hike. It did make me feel rather relaxed in the afternoon/evening after the hike. Didn’t relieve me of all soreness, like I’d hoped, but I did notice that I didn’t feel fatigued afterwards. Want to learn more about it or try it yourself? 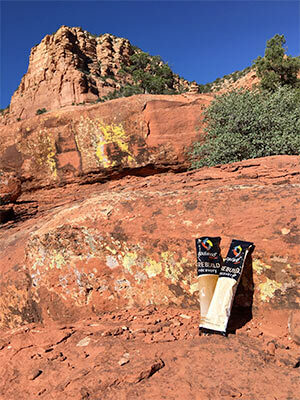 Visit the Tailwind Nutrition website and buy your own for just $3(I recommend the chocolate)!